All these houses share the same site and ownership history. 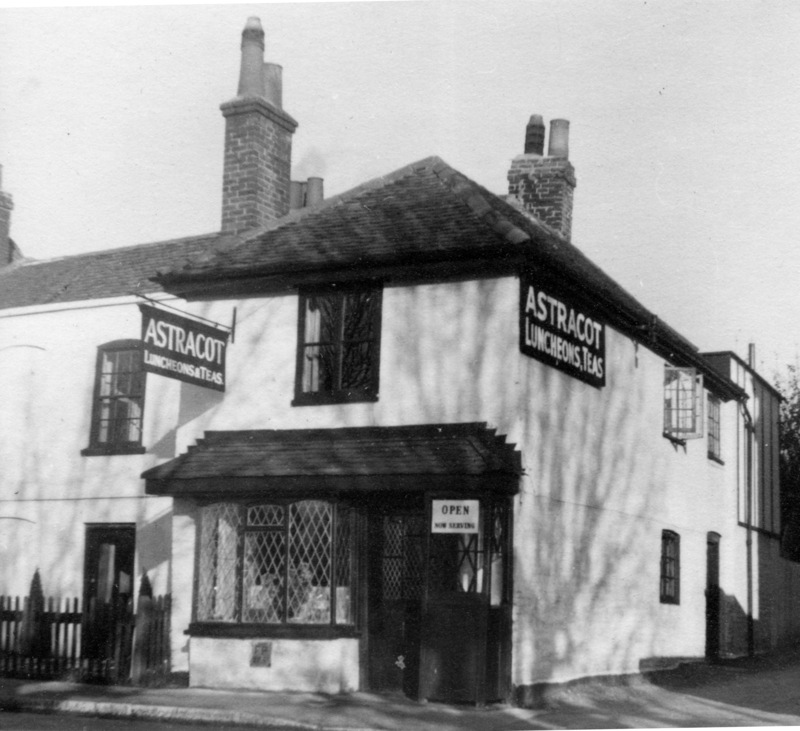 The name ‘Astracot’ is here used for the three dwellings, The Nook, Lovell Cottage and Astracot, 17 to 19 Horton Road, which were originally one house built in the early 1500s, almost certainly by Thomas Mathew. Later, a terrace of nine tiny tenements was built running back behind Astracot, called Challoner Row and demolished as unfit for housing around 1900. 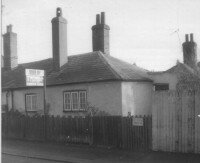 The Dutch House next door was built in about 1815 and the London Road cottages probably at the same time. 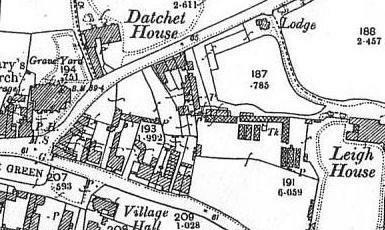 These cottages have been variously the property of Datchet House and Leigh Houses’s owners, but they seem to have been built as part of the Astracot estate. The Little Dutch House was built in the mid-20th century. The Astracot plot, which fronts Horton Road, originally occupied the land northwards to the modern London Road, but the plots have now been divided so that the old routes through are lost. 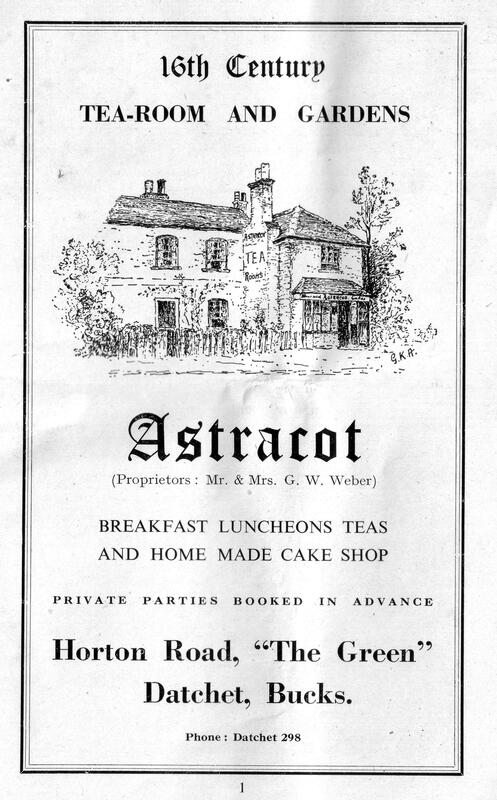 Astracot is well remembered in the village as Mollie Griggs’ Tea Shop. In 1950 she bought the whole property called the Nook, Vine Cottage and Astracot from Kathleen Weber, as well as the goodwill of the tearoom business which had been established by 1920. It was known as Astracot at least from 1935. Mollie and her partner had been in the WRAF and when they found this business to buy after the war its name seemed perfect for them. The central downstairs room was used to seat tea shop customers as well as the eastern end, though when Mollie retired from the business in 1970 that section was again sold separately from the eastern block. In the censuses back to 1841 the western and the central cottages were 1& 2 Vine Cottage, with Astracot being 1, Challoner Row (the others running back from it) and recorded as a shop from the 1850s, when the projecting front wing of Astracot may have been added as a shopfront. In 1849 the whole property had been sold and the eastern end was bought by Francis Pond whose son was called Challoner Pond – hence the odd name for the slum terrace. This shop was at first run by the Dilly family and then as a grocer’s by Edward Houlton. Challoner Row’s tiny tenements were overcrowded and disease-ridden. The worst situation recorded by the census was in 1851 when 32 adults and 19 children lived in the eight dwellings. It was common for these poverty-stricken tenants to take in lodgers to help financially; the sleeping arrangements hardly bear thinking about. 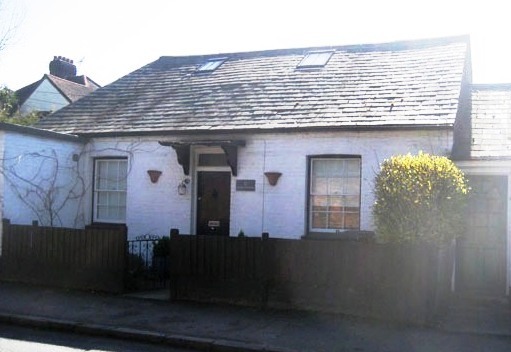 The two Vine Cottages were bought in 1849 by Samuel Coombes, a retired licensed victualler, and his family was still living in the western cottage (The Nook) in 1891. In Lovell Cottage there was a tailor and upholsteress, then a coachman and his family, and in 1891 Henry Grimsdale, a police constable. The sale of the Astracot cottages in 1849 was due to the death of John Richards, Rector of Datchet, through whose family they had been inherited since the 1720s. John Richards had married Eleanor Russell and it is through her family (Russell, Marshall and Arnold) that he owned the tithes as Rector and also the Rectory House (Old Priory). Part of the fortune which Eleanor Russell brought to their marriage in 1800 was Astracot, not as Rectory property but inherited separately by previous generations of Rectors back to Christopher and Mary (nee Bragg) Arnold, married in 1716. Astracot was part of the property which John Richards settled on his daughter at her marriage in 1842, described as: ‘a freehold messuage (house), thirteen cottages, barns and stables etc. called Whetely Londis, formerly estate of Christopher and Mary Arnold’. ‘Whetely Londis’ is a very old name for this property, although it had not been used for about 200 years. Originally, it was simply a variant spelling of ‘Whetely’s Lands’. 1656 Gilbert Baddams has bought houses & lands from Thomas & Sarah Alden; two messuages (houses) called ‘Whetelys Londis’. 1653 Will of Thomas Mathew; he bequeathed his two houses & lands to his daughter Sarah Alden. Also granddaughter Sarah Baddams whose father Gilbert Baddams could buy the property from her as long as a legacy was paid to his other daughter Ellen Mathew. 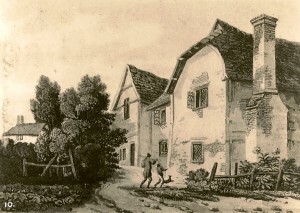 1515 purchase by Thomas Mathew from William Kenner, property called Whetelys Londis (= Wheteley’s Lands); the current hypothesis is that Thomas Matthew built or rebuilt the existing house at about this date. 1489 land from Russell & Hunt to Thomas Whetley; 1445 land from John & Alicia Hunt to Robert Whetley – the origin of the name! It is very unusual to be able to identify an owner-builder of an ordinary house of this date, especially as this Thomas Mathew was related to John Mathew, the likely builder of Church Cottage at the same period. The cutaway model is of a substantial open hall house similar to Astracot when it was built: both had a central communal space (the hall) open to the rafters, with a hearth in the floor, and a cross wing on the west which always had an upper floor, providing a more private room for the owner. The model house had an upper floor at the east end too, but at Astracot a much more recent shopfront extension has obscured that section. 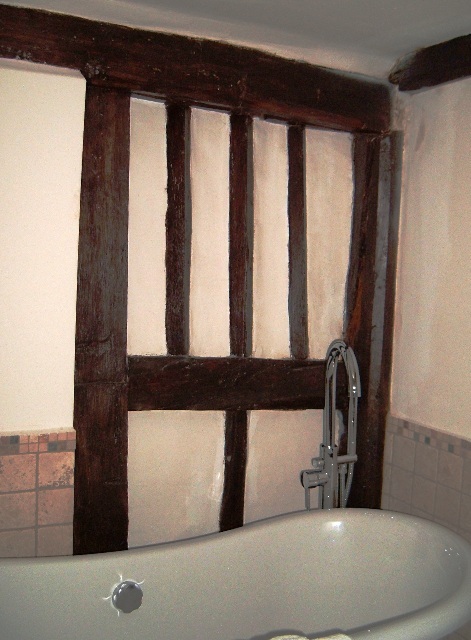 Astracot was updated in about 1600 with a chimney built through the open hall, allowing an upper floor to be inserted. 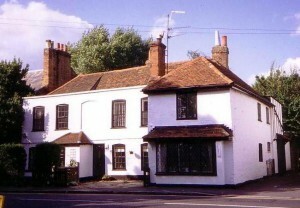 (See also Church Cottage) It was also radically changed in appearance during the late 1700s to the present fashionable Georgian brick façade with sash windows. 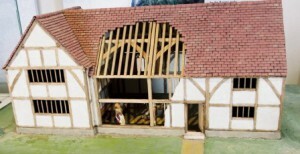 To allow this conversion the original projecting west wing was cut back flush with the central section – the break in the roof line shows where this happened, and cut-off floor joists can also be found. (For another brick façade added to timber-framed houses see Manor Cottages) Conversion to three units seems to have taken place then, if not previously. 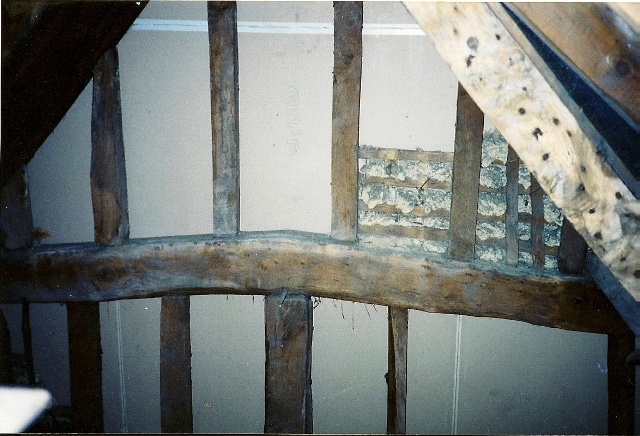 The photo on left, below, is of the original ceiling joists in the ground floor room of the west (Nook) end, which always had an upper storey. Next is a view of the roof timbers above this upper floor; they would originally have been seen from the room, so the timber is smoothly finished. The room has had a ceiling inserted so this space has now become an attic. On the right is a wooden mullioned window which has recently been discovered. It was in the front wall of the original house before the shop extension was built, when it just became part of the internal wall. Its presence proves that there was an upper floor at the eastern end because this is an upstairs window. Nothing is known about this watercolour except that it is labelled Cottages at Datchet, Windsor, and dated by its style to about 1750. However, it is a very good match for Astracot before the Georgian remodelling and does not fit any other buildings in the village. If this is Astracot, the artist was standing further east along Horton Road and has the watercourse, narrowing to a stream and bounded by rough foliage, on his left. The west wing, furthest away, still has its gable roof, later to be cut back, while the eastern wing projects further and is of a different build. The chimney on the east end wall has gone but there is now one on the other side of the shop. This house was built as a farm homestead in about 1812-15 by John Richards. 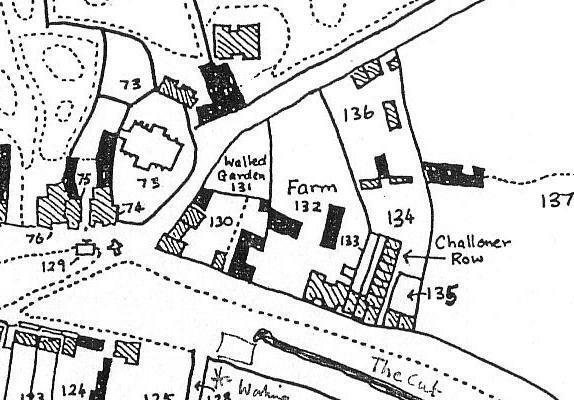 It is in the next adjacent plot to the west of Astracot but so closely against the western end of the old house as to be partly embedded in it. In his will of 1844 John Richards stated that he had (some time ago) bought a freehold house and barn and had taken that house down to build a farm homestead, currently in the occupation of John Willis Goodwin. He wrote that had been obliged to sink money in getting a proper farm building, which he needed for the farmer managing his Rectory lands, and which would technically be called a Grange. John Willis Goodwin was a young member of the powerful Goodwin farming family. St George’s Chapel archives first record this farm house as occupied by Eales in 1815, and Datchet Manor records show that he bought the site to build on in 1812. As a farmstead there would have been a barn and working farmyard on its eastern side, now partly occupied by the Little Dutch House, which appears in the records from the end of WWII. Joseph Boulter’s son Daniel built the culvert which still carries the old watercourse beneath the village greens. If Joseph Boulter was able to build a fairly substantial house for John Richards, he probably also built the London Road cottages and Challoner Row for him. Its original and correct name, The Grange, or Rectory Grange, was continued by Mrs Addie who lived here from about 1910 to the early 1930s and it only became the Dutch House under Lieutenant Commander Anthony Vyvyan Thomas between 1939 and 1950. So far, there is no satisfactory explanation for this name. By 1881 the tenants were no longer farmers but a gentleman (Wellington Shelton) and then a colonel in the army (Philip E Pope). 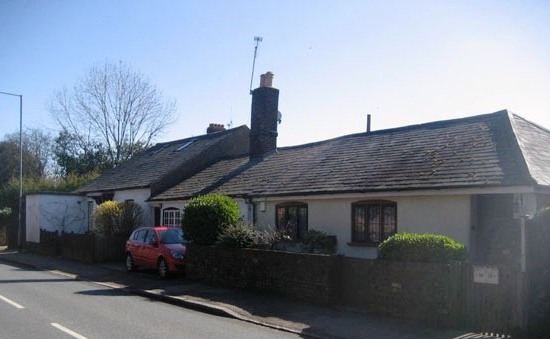 The two cottages 18 and 20 form a pair built at the same time, but Leigh Cottage is different in having a higher roof line and is probably later than the other two. There were several old houses or cottages lying behind these, now rebuilt as 14 and 16 London Road and reached by an old alleyway. (Also see 1839 plan above). When Eleanor Russell married John Richards in 1800 only the main house (Astracot group) was listed as hers, but in 1842 when their daughter married, the property settled on her included ‘a freehold messuage, thirteen cottages, barns and stables etc. called Whetely Londis (see above). 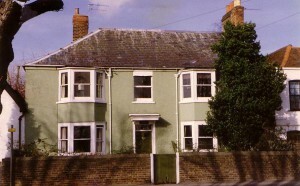 It is assumed that John Richards had the Challoner Row and London Road cottages built in about 1812-15 by Joseph Boulter. The nine Challoner Row tenements and the four London Road cottages (14-20) probably represent Richards’ thirteen cottages in 1842. 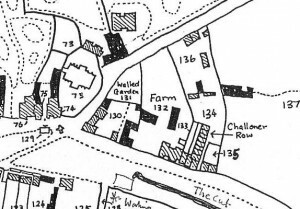 However, one of the buildings in this plot behind Astracot was referred to as a house in two county rate surveys, and was occupied by the Boulters who had probably built the whole group. It is not clear whether this house still exists, has been rebuilt or has disappeared. Leigh Cottage and 1 & 2 Malpas Cottages are first recorded as house names in 1891, but not Waterloo. 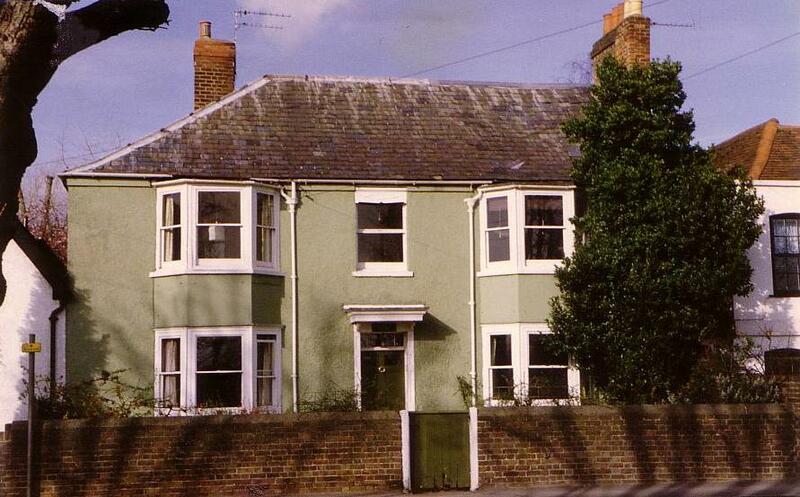 Curiously, Richards also owned a group of cottages along Welley Road which are referred to in his papers as being at Waterloo Place; has this name been found by someone among Richards’ paperwork and assumed it must refer to these cottages instead? The name Malpas is probably explained by the Cholmondely family who owned Leigh House, since one of their titles was Viscount Malpas. 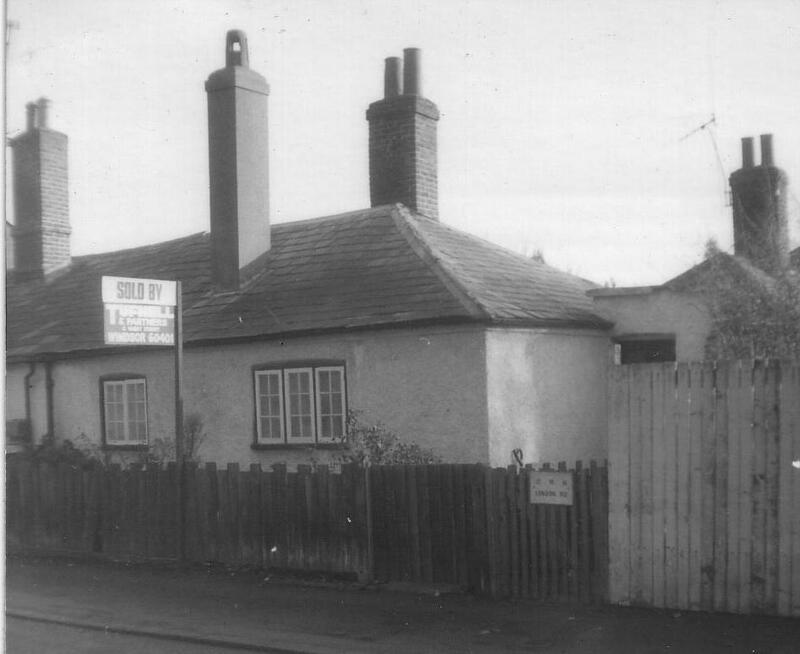 Leigh Cottage was associated with the (now demolished) Leigh House, but was actually just outside the boundary of its grounds and so is unlikely to have been built as a lodge or estate cottage. (There were also two lodges not on this site.) 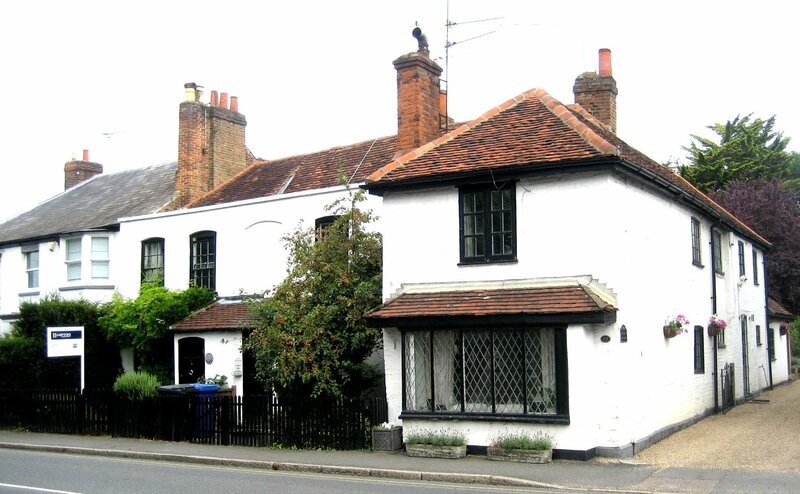 In the 1850s Leigh Cottage had belonged to Lady Needham of Datchet House but by 1866 it was owned by the Rev Hall, the wealthy vicar who bought Leigh House for his own use. This all seems a rather odd scenario and may only be solved by the deeds of the properties themselves. In the censuses before 1891 one of the three (Leigh Cottage?) was designated as a dwelling house with workshops rather than a cottage It was owned by Henry Whapshott and occupied by Daniel Boulter and then by his son Joseph junior. Other members and generations of the Boulter family were tenants at one of the cottages and John Rollins, house painter and parish clerk lived for decades at the other. Nothing had been known about the pre-1800 history of the Astracot property because no documents existed in the usual county collections. That was until recently, when the internet (Access to Archives) provided open access to the catalogues of record offices across the country. The Ipswich branch of Suffolk RO held a large collection of papers once belonging to John Richards of Datchet and eventually deposited there by his descendents who had taken all the legal paperwork to Suffolk with them when they left Datchet. On a visit to Ipswich these documents were found to detail a direct inheritance of houses and land traceable back to the Mathew family, substantial yeomen of Datchet in the 1500s, and already identified as owners / builders of Church Cottage in London Road.